Navigate: Browse Our Films / Gender & Culture / Gender Identity, Sexual Orientation & Culture / Speak Up! 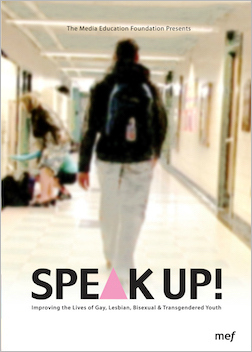 Featuring interviews with Judy Shepard, Danny and Julie from MTV's Real World New Orleans and actor/musician Anthony Rapp, this innovative video offers a powerful look at the ways in which individuals are reclaiming their classrooms and hallways as spaces safe for GLBT students. "SPEAK UP! is an energetic, thoughtful and moving examination of the many and complex issues facing queer young people today. Its visuals and pacing will keep students engaged while its content provides a wealth of material for substantive discussion."